Please Note when Booking Online you are only Paying for 2 Guests, All Extra Guests are to be paid for on Arrival.For E.g. If you put in 2 Adults & 3 Children the final amount is for 2 Guests only. (br /). St Helens typical of many of the towns along Tasmania's east coat, it is both a resort town and a fishing village. 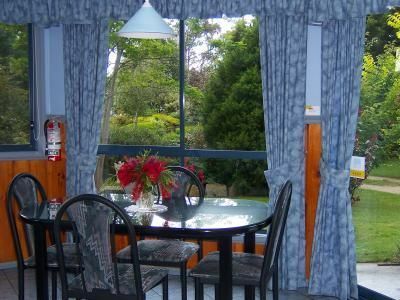 The town is very popular with both Tasmanians for a weekend getaway and interstate and international visitors alike as a spot to sit back relax and enjoy your vacation. Overlooking a large safe bay, perfect for boating and other water activities, St Helens is an excellent location for family holidays. A short drive from the towns centre will lead to many popular and spectacular beaches which prove very popular in the summer with both locals and tourists alike. 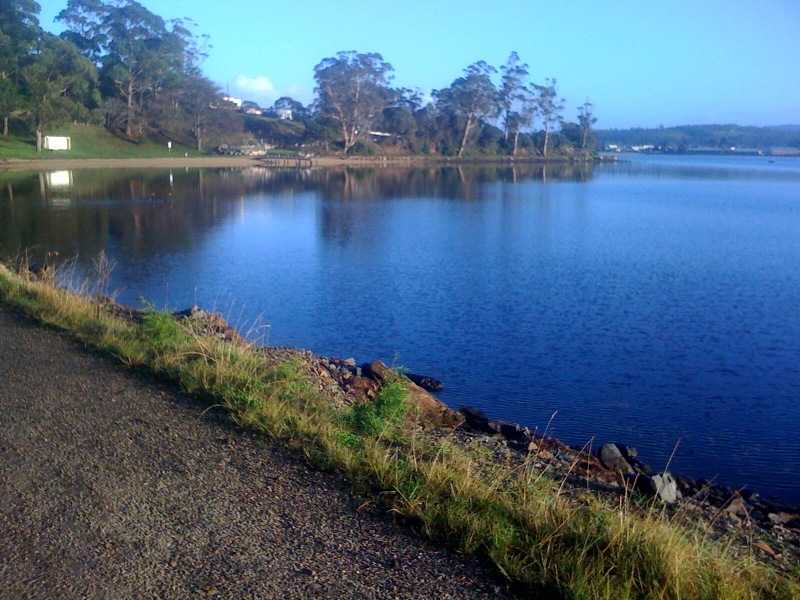 St Helens is located approximately 2 hours by car from Launceston and 3 hours from Hobart. The trip from Launceston can be made via Scottsdale, with scenic views and winding roads as you approach St Helens and the east coast. St Helens weather ranges between 22 degrees – 36 degrees in Summer and 10 – 15 in Winter. Our Winters are very mild. We have many sunny days in Winter. Ideal for seeing our beautiful region. Take advantage of our Special Winter Deals! August Special: When you stay for 2 nights you're 3rd night is Free!! 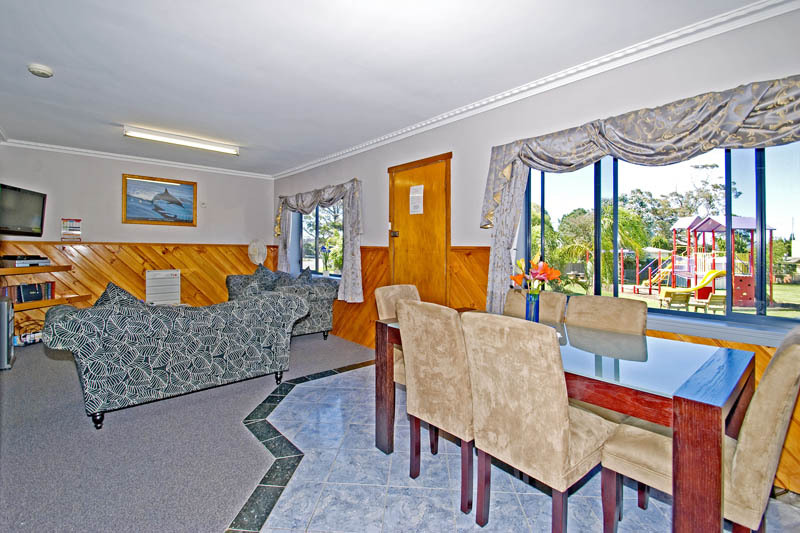 This spacious Apartment is ideal for honeymooners, families, couples or for business. It has a 2 person corner Spa bath in the new bathroom. The main bedroom has a Queen bed & the 2nd bedroom has 2 sets of bunks. (sleeps 6). This Apartment has been completely refurbished including modern kitchen . 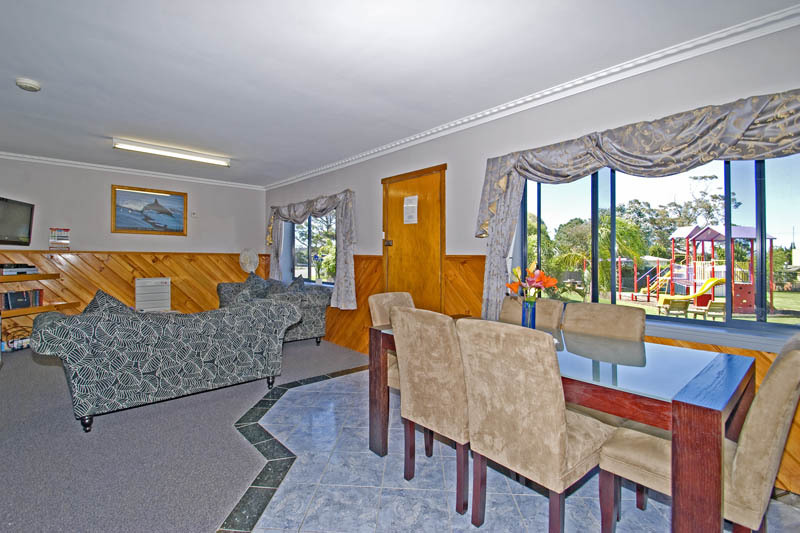 It has a dining area and Loungeroom which has an 81 cm LCD TV, DVD player, and Free DVD's to watch located in the Reception. The Apartment has warm electric heating. 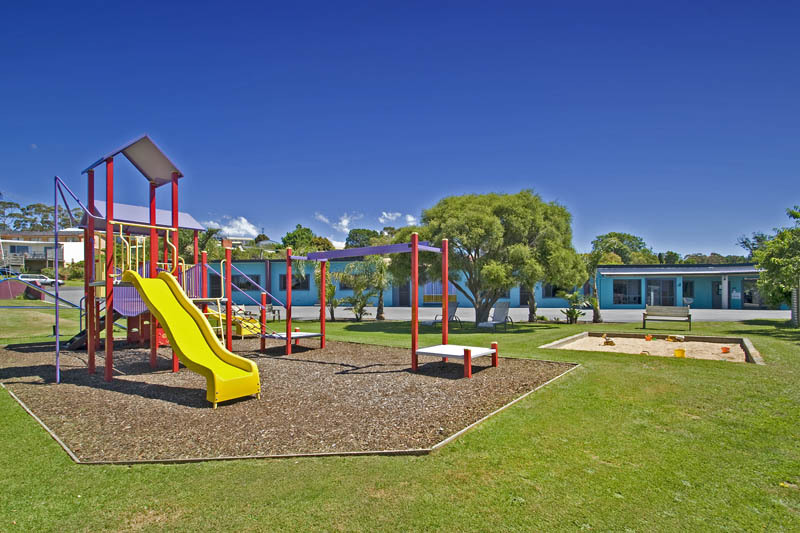 It also over looks the Playground so Mum & Dad can stay inside & read a book while watching the children have fun!! There is 3 steps onto the front door but the Apartment is level inside with no steps. Parking is right at your door. There is Generous Grounds to park your boat or Trailer. The Apartments are only serviced for weekly stays or more. Prices displayed are per Double, Extra Adults $24 each per night and Children under 12 years old $18 each per night. Port a Cots $12each. 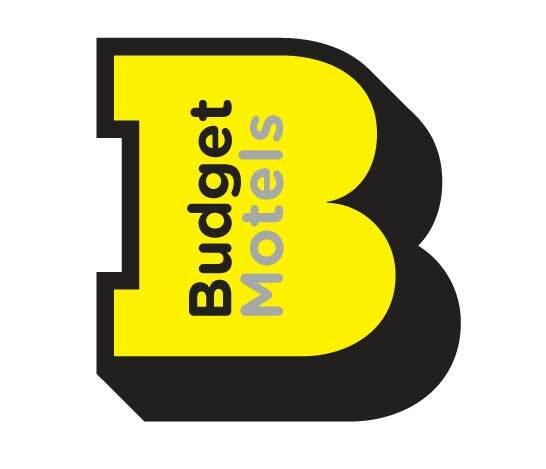 (please book Port a Cots Direct).Please Note, You are only paying for 2 Adults via the Internet when you "Buy". All Extra Guests are payable on your arrival if booked via the Internet. 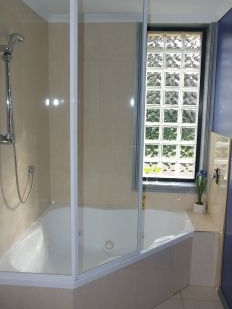 Private 2 bedroom fully self contained Luxury Spa Cottage. The Cottage is set alone in amongst a garden setting. 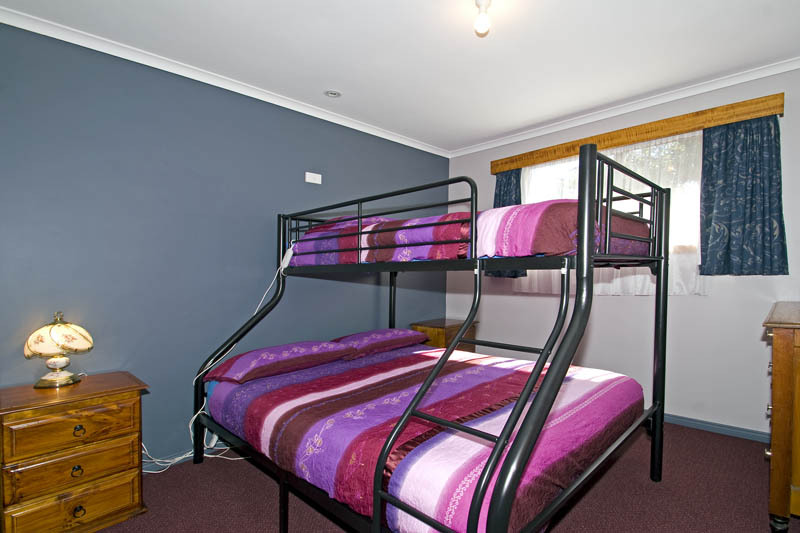 It has 2 bedrooms,The main bedroom has a Queen bed, & The second bedroom has a single bed and a set of bunks which has a Double bed on the bottom & a single bed on the top. (Sleeps 6) It features a fully equipped modern kitchen/dining area & Loungeroom which includes an 81cm LCD TV, DVD Player & Complimentary DVD's to borrow from the Reception.It has a 2 person corner Spa Bath in the Bathroom & has its own laundry & BBQ area. Car Parking is right at the Door on level ground & there are no steps inside or outside of the Cottage. This Apartment has Georgeous Views of the beautiful Georges Bay from your Loungeroom. It features a Queen bed in the main bedroom & the 2nd bedroom has a Bunk bed which has a Double bed on the bottom & a single bed on the top. It Sleeps 5 people. It has a new bathroom & kitchen. 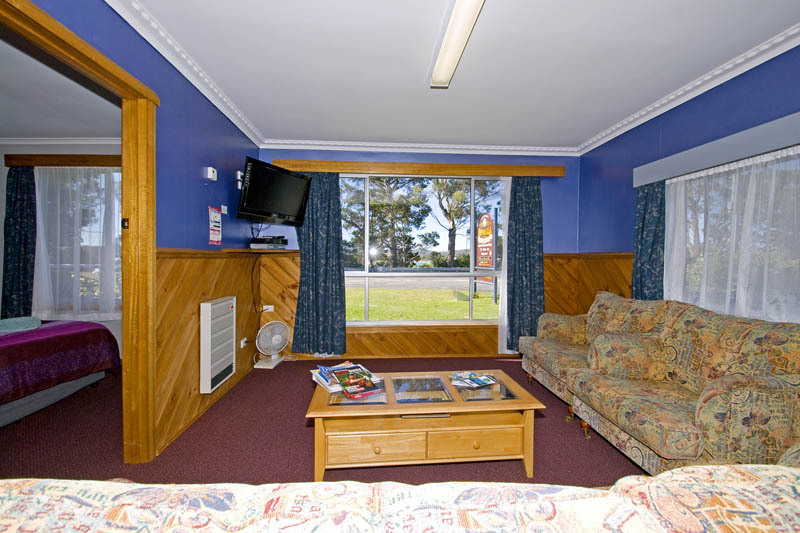 It has a dining area & loungeroom which includes an 81cm LCD TV, DVD player & Free DVD's to Watch located in the Reception. 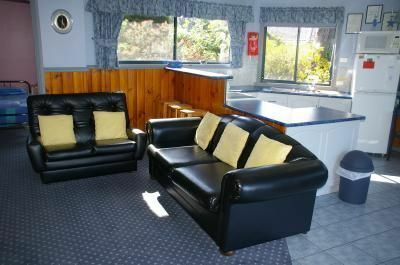 This Apartment has a 3 seater couch & 2 arm chairs in the Loungeroom. 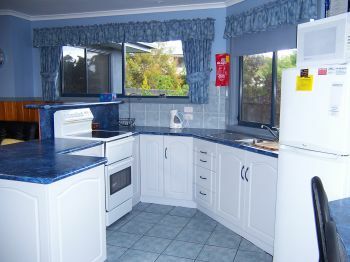 The Apartment is Ground level and Car parking right at your door.It is very spacious inside!! We pride ourselves on giving you a very clean Apartment to stay in! 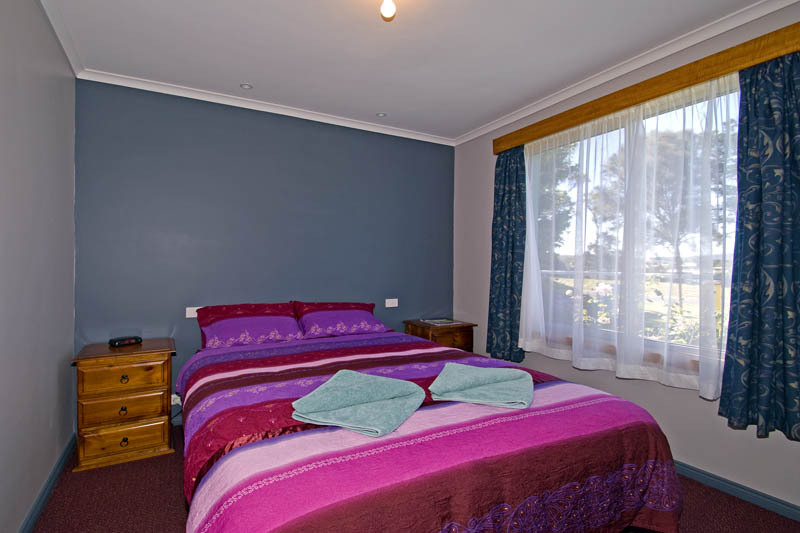 Prices displayed are per Double, Extra Adults $24 each per night and Children under 12 years old $18 each per night. Port a Cots $12 each. (please book Port a Cots Direct).Please Note, You are only paying for 2 Adults via the Internet when you "Buy". All Extra Guests are payable on your arrival if booked via the Internet. 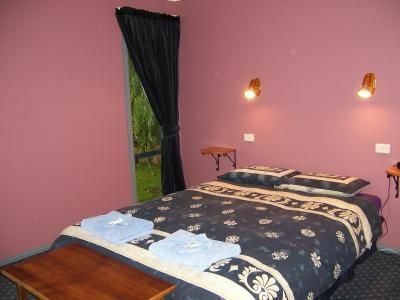 The Apartments feature a Queen bed in the main bedroom & the 2nd bedroom varies some apartments have a single bed & a Bunk bed (sleeps 5), another has 2 sets of bunks (sleeps 6)and we also have an 2 Apartment with a Double/single bunk bed. 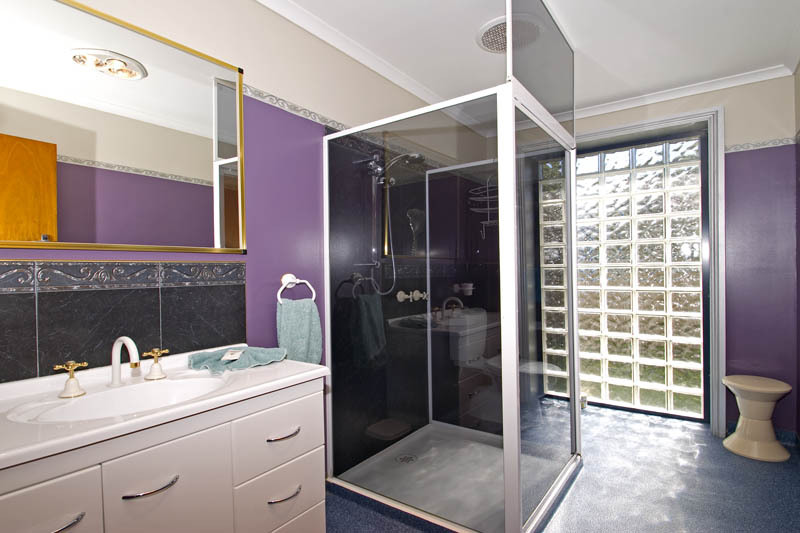 (sleeps 5) Most have a new bathroom (1 Apartment has Disabled access,) & new kitchen, a dining area & loungeroom which includes an 81cm LCD TV,DVD Player & Complimentary DVD's to borrow, located in the Reception . 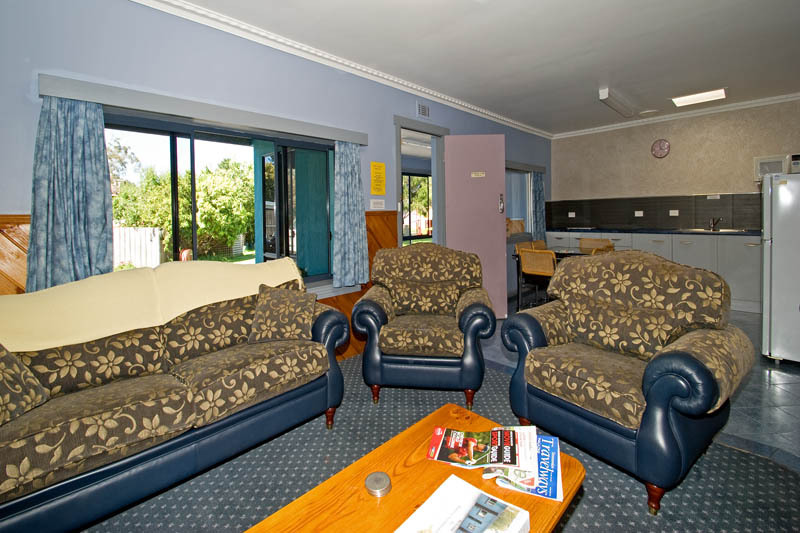 The Apartments vary in the loungeroom; with either a 3 seater couch & 2 arm chairs or a 3 seater & 2 seater lopunge suite . The Apartments are Ground level and Car parking is right at your door.We only have 2 apartments which have 3 steps to the front door.They are very spacious inside!! We pride ourselves on giving you a very clean Apartment to stay in! If you have particular bedding preferences, please phone us so that we can put you in the perfect Apartment for you.